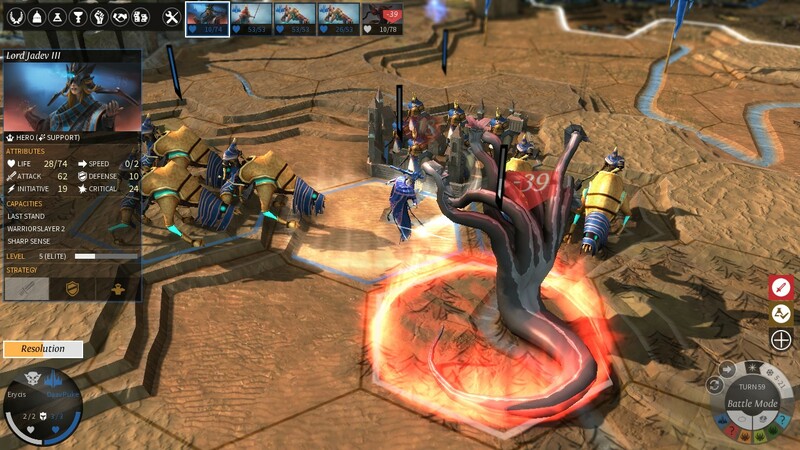 While not finished, Endless Legend already has all the elements of a versatile strategy powerhouse. Developer Amplitude Studios is building a franchise with “Endless” as a theme and Endless Legend is the third project to come from that, so far. Like its progenitor, Endless Space, this title goes for turn-based strategy, but instead of space, it puts that in a hex-grid format on one planet. Its design for the 4X conquest genre remains just as solid as the prior example, if not even more complex, with a dazzling array of cleverly structured gameplay layers. It might even be a little overwhelming to take on, which puts the learning curve a lot higher than previous efforts. Endless Legend starts the sturdy attempt in its presentation of smooth surfaces with a sleek finish, accompanied by peripheral zooming. That zoom part is, oddly enough, one of the more subtle and natural additions to a real point of view. It makes the game give off a tabletop vibe, like playing with actual moving figurines. Landscapes bear multiple verdant themes, showing chasms, flowing rivers, snow patches and more, with tons of animated touches. A restful tone is solidified with a minimal score, though it could also choose something a little more impactful. Currently, the ambient sounds are fitting, but also hard to notice at all at times. Then again, it’s also not distracting, since there’s a lot to do. A game starts off with choosing one of several factions that populate the world. Depending on what race that is, the subsequent playthrough will develop much differently, as each has its own pinpointed focus. For instance, one may require food and channels other, lesser factions scattered around the map to thrive. On the other hand, an alliance may run fully on coin alone, requiring it for all its machinations, from growing out city size to healing units with its power. There’s no overlap in even basic units as one may wield gross titans, while the other has nimble rogues to support the capital walls. Settling cities comes with a hex grid presence border that expands in a certain region, like a province, across the world. This design also contributes to what resources are yielded, categorized in production to make stuff, science for new research possibilities, food for natural growth and Dust coins for wealth. Nodes frequently offer some special supplies that not only look nice on the screen, but also help to build out a strategic growth plan. Territory gets expanded with districts that pan out with an extra row of direct impact. This also has to be done in accordance to the needs of the populace, to keep the approval rating and general happiness high. That’s just one part of the intricate designs. To produce better goods, receive more options in the field and advance the military prowess, the empire needs scientific discovery. This is divided in eras and places on a quadrant of different categories, depending on the current needs. In particular, steadily growing out more options in diplomacy and warfare tactics is a boon. This also takes a form in regional buildings, such as watchtowers that put up beacons near cities for a wider line of sight. An influence level helps towards an empire plan, which is a modifier that grants boosts in a similar quadrant as the science tab. This also bears multiple levels, which stack beneficial factors. Using this makes it possible to get cheaper units or improve research, help empire defense and so on. Influence is also used to assimilate nearby dwellings of creatures, which aid the cause with a unit that can be built, as well as minor additional assistance. To protect armies and settlements, costly heroes can be appointed that behave similarly to the starting race they hail from. Again, that comes with specializations for either the appointed squad or location they’re commanding. 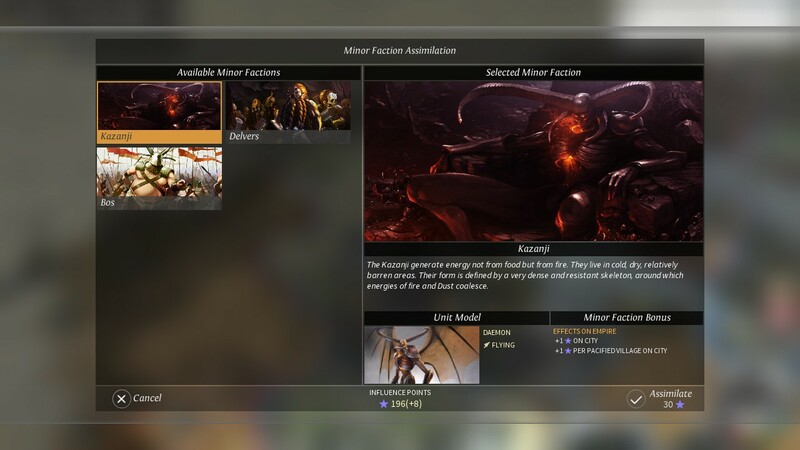 Additionally, Endless Legend applies a roleplaying element that allows for character enhancement through combat, both for units and champions. In the latter example, this is stretched out to a lot more equipment and a skill tree, favoring governing, exploration or becoming a general. Sending out troops in the world also comes with a set of quests to perform. These range from overarching campaign stories, requiring to solve mysteries of the land, to just finding people to mess up or providing a certain resource for the people. Through exploration, a ton more ruins can be uncovered, which hold within them more resources, danger and also additional quests. That makes for a ton of content, without even including battle. There is battle though; there is a lot of it. Diplomacy in Endless Legend is equally complex as its other designs, fitted with tons of options and layering it to multiple factions. It is, however, hard to breach a negotiation. Influence is a key element to staying afloat in the esteem of an opponent and it’s limited in its supply. This will most likely lead to a ton of strife and more than periodic acute wars breaking out. Enemies don’t mess around either. Artificial intelligence (AI) is fierce, relentless and focused heavily on warfare. Once the war trumpets sound, it’s most likely going to be time to turn the tide fully towards grinding out units or suffer the consequences. In the meantime, small factions will use this opportunity to start pecking away at armies and cities as well. Those who want conflict will want not in this 4X struggle. Turmoil is positively everywhere. 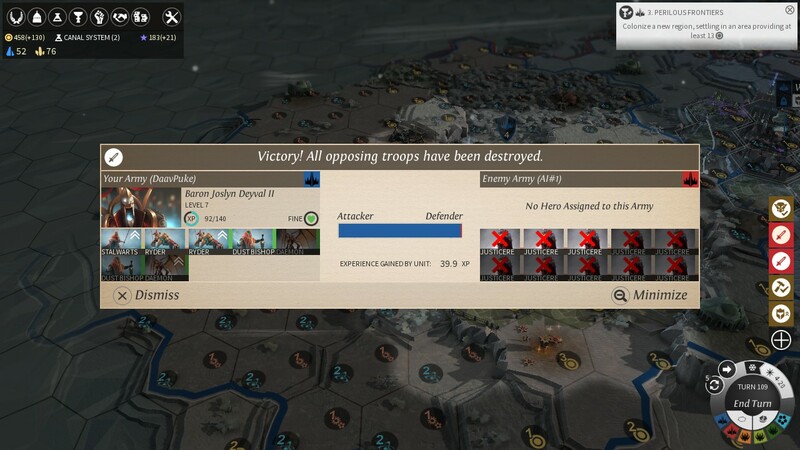 When engaged in battle between parties, whether it’s two squads or a siege on the city, the first screen will display basic info on the present units and their winning chances. From there, it’s possible to choose a certain attack stance, before deploying units individually to a separate playing field that consists of the same area the fight is taking place. That includes strategically important height differences between hexes. After setting up the pieces, battle resolves semi-automatically. It’s not the clearest system as to when things change, but there’s an expectancy to play like a game of chess, thinking several moves in advance, while AI flutters across the map. Should nearby squads have stacks nearby, they’ll also join in as reinforcements during combat evolvement. Further adding to tactical choices, there’s an important distinction between individual units through a few mechanisms. Defense targets are required upfront, since the enemy can usually bounce back the first blow and this needs to be absorbed for more aggressive, but soft-skinned units to move in later. Researching a select few more types also increases winning chances greatly. One healer in the squad makes fights instantly more versatile, as fatigued fighters can now move back to mend wounds, before going back. Then there are hero modifiers with terms like “knightslayer” and such, which further can debuff opponents, damage adjacent enemies and so on. It’s a lot to take in, but it’s structurally sound; that part is tangible. That’s also the only downside of this work in progress though. 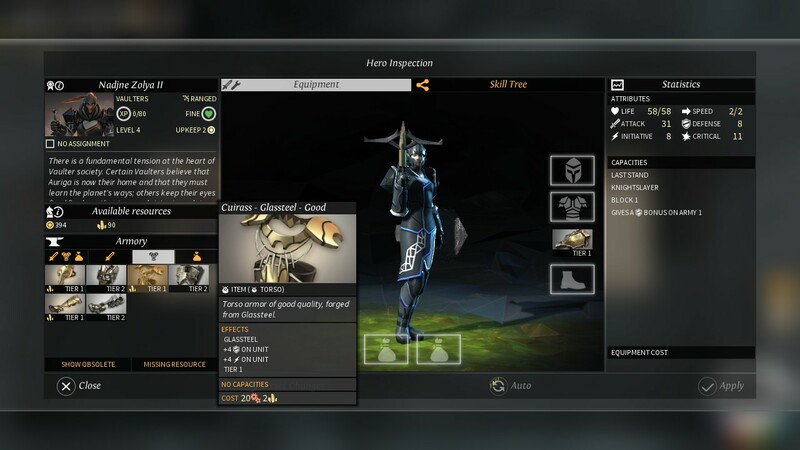 Endless Legend is immensely layered, but lacks the necessary tool tips and compendium to properly explain its many facets. At the same time, it already applies these features and expects its players to follow suit, because the AI will not go down without a fight. It’s a downright violent world and being thrown in isn’t helping a lot towards finding that epiphany moment where everything sticks. It requires waiting for a lucky break or two, before it’s possible to get into a comfortable enough position to start learning and that’s certainly not everyone’s favorite way to play games. 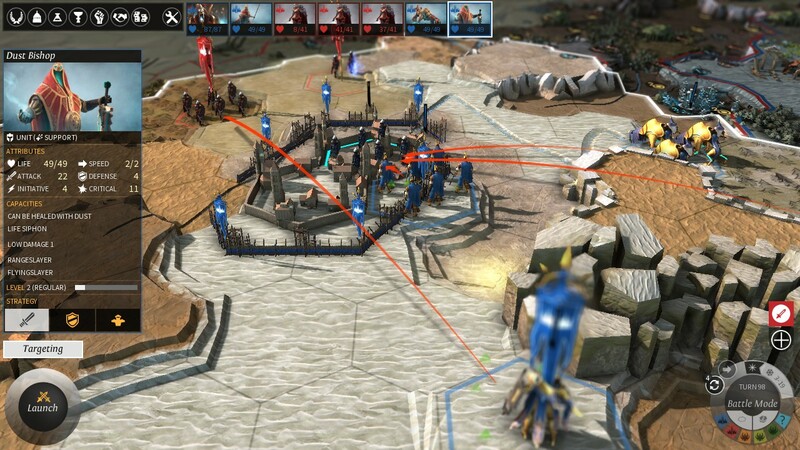 For those who can hold their own, Endless Legend is a testament to intelligent game design. Layered to form an effective synergy between its many elements, this strategy title employs exploration, management, roleplaying traits and diverse combat elements that could take a million forms in an equal amount of playthroughs and never become stale. That, put into a gorgeous tabletop atmosphere with a barrage of content is downright impressive, certainly for a game in active development. 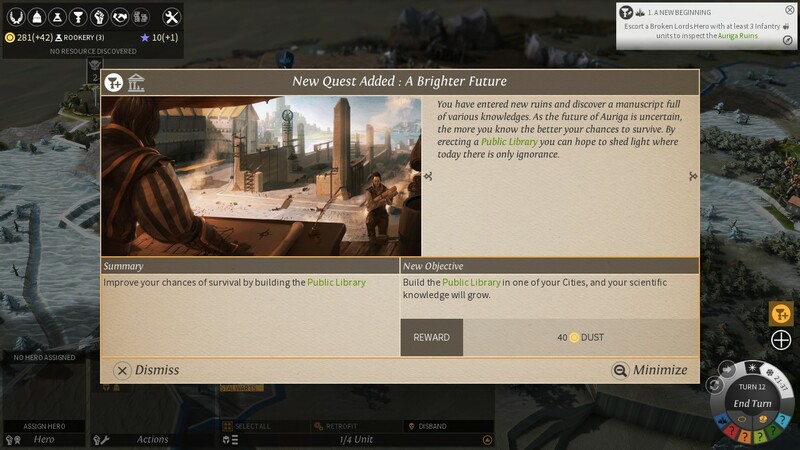 Endless Legend is a savage beast.